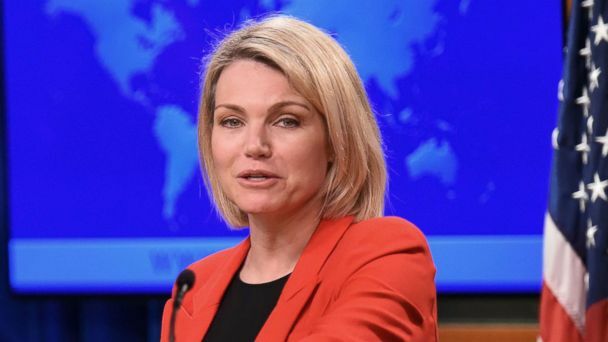 "Heather Nauert will be nominated for the ambassador to the United Nations," Trump said as he left the White House for a trip to Kansas. "She's very talented, very smart, very quick and I think she's going to be respected by all." She still must be confirmed by the Senate and it's expected Democrats will raise questions about her lack of extensive diplomatic experience and views she expressed while working at Fox. After Secretary of State Rex Tillerson was fired, Nauert was promoted to acting under secretary of state for public diplomacy and public affairs, but she lost that title, while retaining the responsibilities of the position, in October because she was 'acting' for too long. Haley, the former South Carolina governor, has been a vocal advocate for U.S. foreign policy in New York. In October, Haley announced she would leave the post after completing two years in the Cabinet-level position, exiting on her own terms and with few public spats with the president. "She's going to work with Nikki Haley" to replace her, Trump said Friday. "Our country needs a far more experienced voice in this, the biggest of world stages at this most uncertain and unstable of times," said Brett Bruen, a former diplomat who served as director of global engagement in the Obama administration. A senior administration official told ABC News, "Heather would be an astounding advocate for America at the United Nations. She is smart, she's so hardworking, she never gives up working on behalf of American values." Nauert met President Trump at the White House in November twice to discuss the role, two sources told ABC News. He reportedly wanted another woman to take on the role, although it's unclear if the position will remain in the cabinet. It was under Presidents Obama and Clinton, but not under either President Bush. Nauert will first have to face a Senate confirmation hearing and be confirmed by the full Senate.